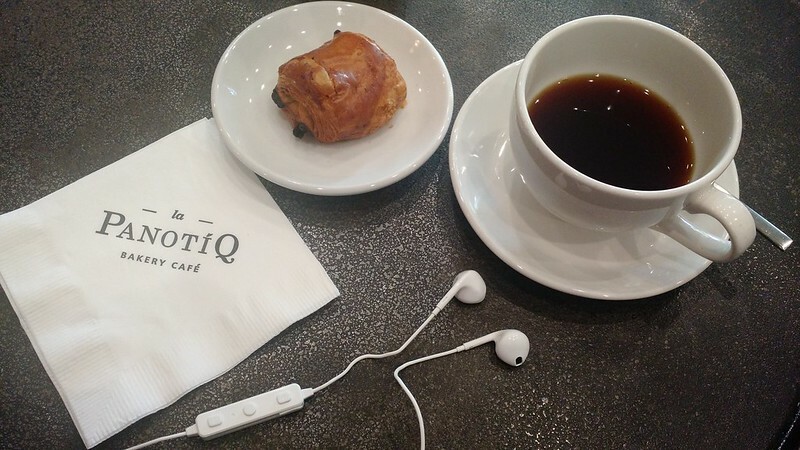 I am writing this while I am having a breakfast at La PanotiQ cafe in Mountain View. I am listening to Episode 32 of Jerry Colonna's Reboot podcast1. He was discussing about personal values with two other guest Venture Capitalists Bryce Roberts and Chris Marks. They talked about their VC businesses, but the central question in this episode is essential also to people in different businesses: "In my own work, what are my values? What are my priorities? What would it mean to invest in being myself?" I enjoyed listening their stories and felt I learned something from the people on the other side of startup world. On learning, Ivan Sutherland said, "When denied my minimum daily adult dose of technology, I get grouchy."2. I feel the same way. But honestly speaking, it's got so much tougher to keep learning everyday after we had a baby. I can no longer "irresponsibly" sit at my desk to crave for knowledge after I come home from work. There is food to prepare for her. There is bath. There are diapers to change. I just don't have time to quietly sit down to open a book to read. On an unrelated topic, I've been needing to upgrade my headphone. After seeing Apple released Airpods, I wanted to try a wireless headset. I went to a BestBuy store just opened nearby our house and found one 3 sold at $25. I tried them on at La PanotiQ for the podcast listening. Though this product still has a cord between left and right earbuds, it was still a liberating experience, not having to be tangled between the phone and the headset. I went home from the cafe, and started to clean the kitchen. I listened to another podcast. I am not so much of a music person. I mostly want to use the headphones to listen to podcasts and the dictations of books and articles. But this is great. I can do boring tasks while I am learning something. But I was not quite happy with the cord between left and right earbuds. I shopped some more and found Rowkin headset4 that came out not so long ago. This headset is really small. It's so small and light that it does not need a loop around the ear to prevent the fall. It just has to be lightly pushed into the ear. I don't think I would lose it on a light jogging 5. After receiving Rowkin, I took my 1.5 year old daughter for a walk. She does not care about me while she is on the stroller. So, I plugged the headset in. I tried Instapaper's "speak" feature to listen to a long New Yorker article about Sam Altman 6. The synthetic voice coming out from the Android phone still sounds flat, but it's much more listenable than some years ago. I can live with it. I'm now more committed to the idea of reading through the ears on the go. What about books? English is a foreign language for me. I read a lot in English at work. At the end of the day, my brain is too tired to read English writings for fun. So, I have not been reading casually as much as I wish. Somehow listening is much easier even in English. After watching "The Imitation Game" 7 on Netflix, I bought "Alan Turing: The Enigma" by Andrew Hodges in Audible format on Amazon for the first time. Each chapter in this Audible is about 25 minutes. It's much slower pace than my normal reading speed. But it probably come close when I am tired. And it's certainly easy to progress to the very end of the book at a steady and predictable pace. I can finish it in little over a month if I listen 2 chapters a day. Not bad for a 587 page book (when printed). There are limitations of course. When I listen to web articles, I need to choose the articles with fewer graphs and numbers. It's suited more for good stories on New York Times, New Yorker and so on. Rowkin's battery lasts about 3 hours per charge. 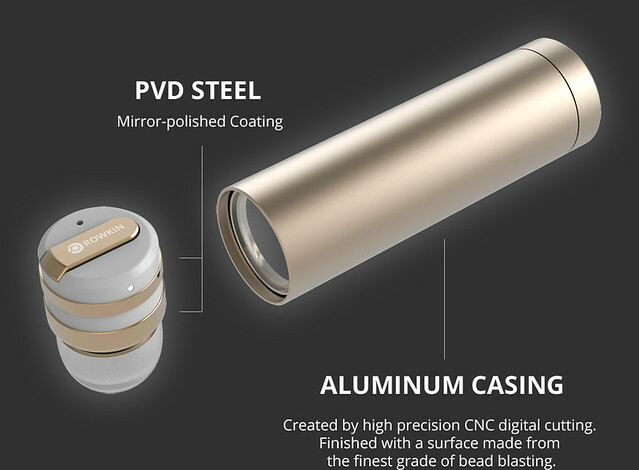 The lipstick-shaped case is a bigger battery that you can recharge Rowkin on the go. This is enough for me if I listen during the train ride to work, put it back in the case for charging at work and listen again on the way home. The battery probably is not enough for heavy music listeners 8. Bluetooth audio connection is mostly reliable for me, but sometimes the connection does get interrupted. It's an occasional irritation that should be solved in the future version. This may be changing my life style. Unlike radio, I get to choose exactly what I want to listen to. The information flows into my mind through the ears from such a small and wireless device. It makes me feel that I am injecting knowledge directly into the brain. The headset of course can be used for talking on the phone and for talking to Siri or Google. With the device so discrete, I must look talking to myself. That makes me wonder if one day we can "talk" without moving our mouth. That would make us communicate like Ghost in the Shell both with humans and machines.